When a client pays for a tip with credit card or check, you have the option of giving the employee that tip money in cash from the cash drawer at that time, or keeping the tips in the drawer and reimbursing them later or as part of their paycheck. 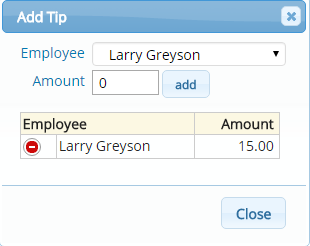 Note: Tracking employee tips makes sure the proper employee is payed out whether or not you keep tips in the drawer. - To track tips: Select "Yes" next to Track Employee Tips under "Settings" in each employee’s profile. If you DO keep tips in the drawer, you must select "Yes" to Keep Tips in Drawer in your Business Settings, under "Point of Sale Settings"
If you DO NOT keep the tips in the drawer (pay-out the employee right away), you must alternatively have Keep Tips in Drawer set to "No"
* If you are NOT USING CardConnect as your integrated credit card processor, ALWAYS add the tip(s) first! — before you enter the method of payment on the ticket!